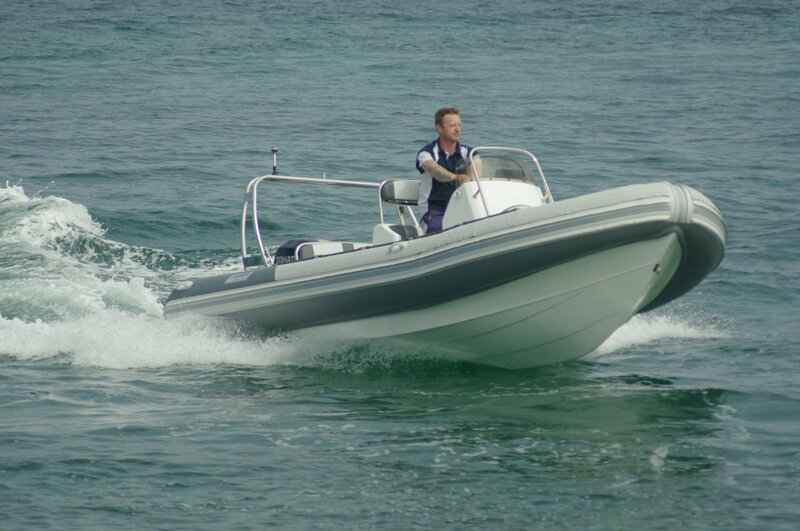 At 5.75 metres this Falcon RIB is smaller than the maximum Rottnest tender length, but there is an advantage in the more modest size. The typical garage is 6m x 6m; the Falcon will fit in it, reducing deterioration from the sun and other environmental elements. When out in the open, protection is provided by a standard wear cover over the buoyancy tubes which also defends against boarding feet. One of the delights of the Falcon is that practically anything about it you do not like, or anything you wish you could add, is fixable. Seabreeze imports bare hulls from Europe and sister company West Ribs manufactures everything else locally. This means you are free to add, subtract or change to create the boat that fits your needs. For example, the review boat had no provision for shade; West Ribs will happily fit one. For use as a tender this Falcon pretty much has it all, space and seating accounting for most of the needs. Nothing sophisticated in the anchoring department but, of course, West Ribs can remedy that with a bow roller. There are official seats for six with a semi official seventh on the bow platform. Infinite casual seats of course on the buoyancy tubes. The grab line for these people is drawn taut along the tubes’ tops – exactly right for the job in the way that the common sagging beckets are not. A potentially maddening possibility in a power boat is a fuel system that not so much leaks as oozes. For many of these boats checking for the ooze or leak involves cutting out a piece of deck to expose the fuel system. Not here, because removal of a lid exposes the tank and fuel lines. More to the point, the need to expose is lessened because during the fit out process West Ribs tests the fuel system to 3 psi – far higher than its operating pressure. In a nice touch the house and starting batteries are located in the console. Not only is this more convenient for checking and maintenance, but it assists with trim; marine batteries are heavy. The switching gear for charging these is, thankfully, the foolproof kind (until they invent a better fool). Our Falcon was powered by a 115hp Tohatsu four-stroke. Most people who have heard of Tohatsus assume that they make only two-strokes, although discerning people know that those two-strokes are excellent. Not that it matters here: this Tohatsu is a Honda under the skin; literally. Lift the cowl and there is the Honda name on the power head. Nothing new there: Yamaha built Mercury’s four strokes for many years (and Tohatsu built many of their small two-strokes). Not a lot different to the way the automotive industry operates. The Falcon proved an easily driven boat with its moderate deadrise and soft chines; small throttle openings gave disproportionate speed meaning, probably, good economy. It was a nearly windless day, but vigorous use of any available wakes suggested a soft riding hull. Naturally we played a bit and found a fun to use boat. Fun was put on the agenda by West Ribs: the gantry that carries aerials and the like also has a ski rope bollard. Provision of storage is almost at the fetish level; locker lids are everywhere. Under the deck alone are scuba lockers and an ice box. All of which means an absolute lack of clutter on the deck. Exactly as a tender needs it.